In this post we will share some great things to do in Mysore. But first it was a bit of culture shock to be back in a bustling city after the peace of Kerala countryside. Mysore represented the second state we visited (Karnataka) and is an important tourist destination, known for its royal heritage and lavish palace. It is one of India’s cleanest cities and most recently has become a popular centre for students studying ashtanga yoga. The sidewalks did seems pretty clean and the traffic more orderly, although the juxtaposition of cows, cars, rickshaws and vendors overwhelms the senses. Occasionally I question why we are traveling in India with kids. Like today when we arrived in Mysore, a bustling city after days in quiet villages and the countryside. Holding tightly onto the kids hands as we navigate the cow plop and other questionable, smelling stuff that dots the sidewalks, I can’t help but wonder “why?” Richshaw drivers stop us constantly wanting to take us somewhere (which I am sure includes their friend’s shop) and we are ever watchful of the cows meandering the streets (yes, even in the middle of a city) and stray dogs that our kids have been taught to be wary of. Dirt and mud makes its way through our flip flops and our eyes sting from the dust and pollution of the gas guzzling rickshaws and cars. Of course no one can understand that we are just out for a walk. If we get disoriented and I want to take out my guidebook with map, I know we will be hounded by the rickshaws, so we soldier on. The kids are hungry because we skipped lunch because we were on a 4 hour bus to get here. Why can’t they be satisfied with biscuits and chips and tictacs – their staples on this trip? It is then that I spot the KFC and I know I can be a hero. Fries and fountain drinks for all and I wonder how I have slid so far from my food philosophies of organic and minimally processed food. The kids have been living on not much more than white rice, chapattis and the above snacks. The kids are now hyped up on sugar and driving us crazy. It is wonderful to spend so much time together, but sometimes I want to send them away to school or somewhere for 6 hours, to get a break. But then seeing their faces light up when the Mysore Palace lit up for its weekly Sunday festivities melts those “other” moments away. 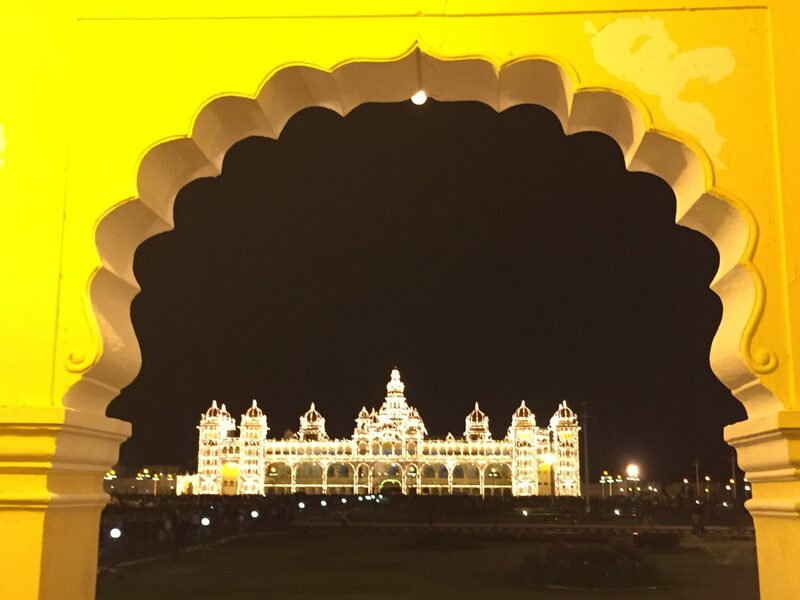 I had seen the beautiful photos of the Mysore Palace lit up, but I wanted to see it in person. Your need to plan your stay for Sunday nights as it is only lit up from 7-7:30pm on Sundays. This is one of the best things to do in Mysore, so go a little early to get a good position. The carnival type atmosphere is worth it alone as hoards of people crowd into the palace grounds to see the lights and the people watching is entertaining enough. The Palace is spectacular day or night and the 100,000 lights provide quite a sight. Seeing the Palace all lit up at night was spectacular, but walking through the Palace during the day allows you to see all the amazing details and magnitude of the place. We toured the Palace during the day (not allowed to take any photos inside) and since we didn’t visit the Taj Mahal this trip, the Palace more than compensated. The carvings on doors and ceilings, the amazing arched domes painted with majestic scenes, the lovely stain glass is like visiting a Raj themed fairy tale. The kids loved their audio guides again and listed carefully to the history and details of the Palace. You could spend hours in this market that just bustles with activity all day long. The market is neat and organized and is a photographer’s dream. It is a hive of activity as vendors shout out to passing customers and you get taken into the stream of people. My favorite area was the flower market where garlands and offerings of jasmine and other flowers scented the air. In the outer part of the market cows wander through and we watched as a shopkeeper chased away a cow that had snuck some rice from his sack. While Mysore may be one of India’s cleaner cities, it is not without its garbage that piles up along the road, which the many wandering cows sort through. 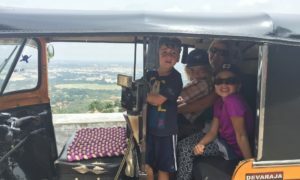 Kids love zoos and Mysore Zoo more than met our expectations and is a great thing to do in Mysore. For a mere $3 CAD our family spent a lovely afternoon strolling along the exceptionally well kept lush grounds. The zoo is known for its very high standards and was originally part of the Palace and known as the Palace Zoo. Mysore Zoo – 140 rupees ($3 CAD) for our entire family. We had lunch at the cafe here and it was okay. 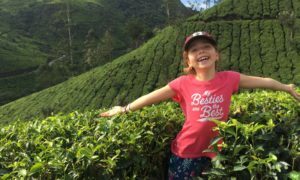 Our kids may not be spending a lot of time on reading and writing during our travels, but they learn so much from our travels. The Zoo is a natural learning environment and provoked many interesting discussions including the apes to humans evolution. This hairless monkey clearly (and eerily!) shows how closely related we are. The best thing about the Zoo was how quiet and peaceful it was – no garbage strewn around and no honking horns and vendors trying to sell you things. As we entered the Zoo, we came to a “plastic free area”. They searched our bag and we had to pay a 10 rupee deposit on our water bottle. Our packaged crackers had to be emptied of their packaging into a newspaper. Clearly this was why the Zoo was so clean and pristine. There were signs everywhere about not littering, keeping the animals safe, etc. When we bought popsicles, the server unwrapped them for us. Usually garbage bins are really hard to come by outside but in the Zoo, there was one every few steps (following the Disney rule). We pondered if the unwrapping ice cream helps teach the importance of not littering since it is being done for you and we wondered if maybe the signs would be enough to ensure people used the bins. As we walked Ella watched as a lady who somehow had her wrapper threw it in the garden between the sidewalk and cage. Clearly the unwrapping was necessary. 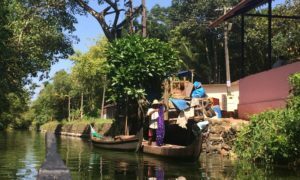 The kids particularly have a hard time seeing littering happen and we try to walk the line of being environmentally friendly but also culturally sensitive. We had a rickshaw take us around some of the other Mysore sights for a morning. Chamundi Hill provides great views over the City and introduced us to the Hindu story of Chamundi, the demon slaying goddess. Chamundi getting ready for a paint job before the big Dasara festival. We also got to see Nandi (Shiva’s bull) carved out of solid rock from the 1600s. If you are looking for unique things to do in Mysore, touring the local industries will hit the spot. Mysore is known for its silk and sandalwood industry and we visited the government factories. Paul particularly enjoyed the sandalwood factory where they process sandalwood into precious sandalwood oil to make luxurious soaps. This led to a spontaneous chemistry lesson on steam extractions and distillation for the kids, which I mostly zoned out for. Paul had connected with our rickshaw driver the previous day and we were really hoping to avoid the back alley shop visits. Unfortunately, as soon as we pulled into the alley, I knew what we were in for. We walked in to a girl doing an incense making demonstration and then moved on to a man showing us the various scented oils. The kids of course were in heaven trying the different fragrances and we ended up with a couple of vials. 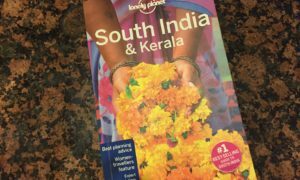 After staying at homestays for the last 2+ weeks, we showed up in Mysore without a place to stay and landed at the Lonely Planet recommended Park Lane Hotel. Hotels in India are frustrating for our family because they ding you for extra charges for each of the kids and you pay 20% tax. So the room that starts at $38 CAD ends up being $66 after extra kid charges and taxes. This hotel is basic and cute (or kitsch as the guidebook describes) and totally acceptable for $38, but way overpriced when you are paying $66. Tomorrow we head to our third state in India, Tamil Nadu – to the hill station of Ooty. We stayed at the Park Lane Hotel in Mysore. Base rate was 1800 rupees/night ($36 CAD). Charge 500 rupees for each additional person/bed (no charge for Miles at 5). So our total was 3300 rupees/night ($66 CAD). Good location right near Mysore Palace. Rooms are clean and staff friendly. They give you a large amenities kit and there is even a tiny pool on the rooftop. Mezzaluna Restaurant (near the Gokalum yoga area) – this was a great break from Indian food. The kids loved the stuffed chicken and pasta and garlic bread. Mains 200 rupees ($4 CAD). We took a rickshaw out here for 200 rupees return. Rickshaws around town – bargain hard – you shouldn’t have to pay more than 50 rupees ($1 CAD). We paid 400 rupees ($8 CAD) for a rickshaw for half a day. we ended up taking an AC direct bus from Kalpetta (Wayanad) to Mysore for 1100 rupees for our family ($22 CAD). We took a rickshaw from the Wayanad homestay to Panamaram, a local bus to Kalpetta (60 rupees for the family), then the AC bus to Mysore.